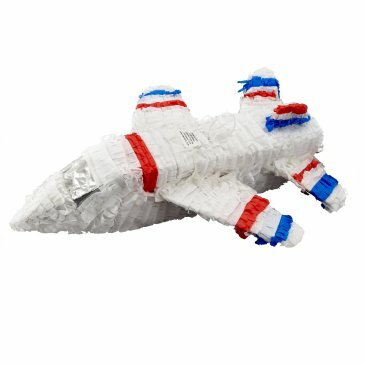 Get a Jet Pinata to use with your Airplane or Jet Party Ideas! Little boys love airplanes and that's what makes this such a great idea for a kids party! This Jet will fly around where you tie it and then you can let each party guest take a whack at it...with a stick while blindfolded. The lucky guy or girl who hits it just right will break open the pinata so all the goodies inside will come spilling out. Watch everyone scramble to fill their goodie bag with the candies and treats you hid inside! Everything the future jet or airplane pilots at your party will need to have a high flying good time!